Yangervis Alfredo Solarte simply known as Yangervis Solarte by fans is a Venezuelan professional baseball player who currently plays for the Toronto Blue Jays of Major League Baseball (MLB) as an infielder. Before making his major league debut for the New York Yankees in 2014, he had played for the Minnesota Twins and theTexas Rangers. Yangervis has also played for the San Diego Padres. Check out other detailed information about this talented Venezuelan baseball player. There isn’t much online about Solarte’s background, early life, parents and if he has siblings or not. The only information we do have is that the infielder was born on 7th July 1987 in Venezuela and that it was his uncle Roger Cedeño that convinced his agent to take Solarte as a client as a favor. Solarte began his career back in 2005 after he signed a deal with the Minnesota Twins. He worked his way through the lower levels of the Twins organization and soon reached Double-A in 2009, but that season he was only able to play 16 games due to the surgery he had on his right shoulder. He was fit to play again in the 2010 season and he shuttled between the High-A Florida State League and the Double-A Eastern League. For the 2011 season, he played solely with the New Britain of the Eastern League recording a batting line of .329/.367/.466 in 121 games. At the end of the 2011 season, Yangervis Solarte signed a minor league deal with the Texas Rangers, which included an invitation to spring training. He spent the next two seasons (2012 and 2013) with the Round Rock Express (Rangers’ Triple-A affiliate). During these seasons he made starts at second, third, shortstop, left field, as well as first base and also recorded a .282/.331/.404 batting line and 23 home runs in 263 games. After the 2013 season, Solarte became a free agent again and in January 2014, he signed a minor league deal with the New York Yankees. He had a good debut start with the Yankees as he recorded a 20at-bats, with four doubles and six RBI. In April 2014, he recorded two doubles and became the first player in the Modern Era (since 1900) to hit six doubles in his first seven games in the Major Leagues. In his second play against the Tampa Bay Rays, Solarte recorded a 5-4-3 triple, later in that same play, he hit his first big league home run against pitcher Grant Balfour, then made his second home run; a three-run shot, against the Milwaukee Brewers, which saw them winning the game, by the following month. Solarte held the highest batting average in the American League. By July, he had batted .254/.337/.381 with 6 home runs, and multiple starts at third and second base and one at shortstop. The Yankees traded Solarte alongside teammate Rafael De Paula to the San Diego Padres for Chase Headley, just a day after, Yangervis Solarte made his debut for the Padres against the Chicago Cubs, he spent most of his time playing Headley (third base) but also made starts at second, shortstop, and in left field. At the end of 2014, the Venezuelan recorded .267/.336/.355 hits with 4 home runs in 56 games. At the beginning of 2017, Padres signed Solarte to a two-year contract with a club option for two additional years. At the end of that season, he batted .255/.314/.416 with 18 home runs in 128 games. He also made 74 starts at second base, 24 at short, 18 at third, and 4 at first. 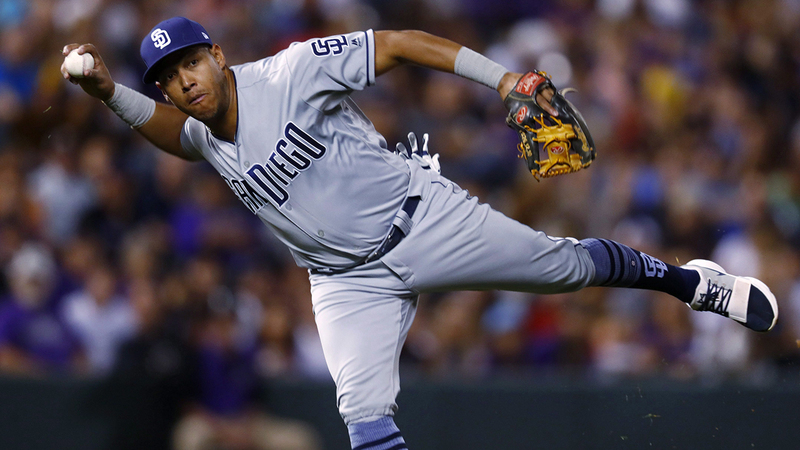 Just a year after, the Padres traded Solarte, this time to the Toronto Blue Jays in exchange for two minor leaguers – Edward Olivares and Jared Carkuff. Following Josh Donaldson‘s injuries, Solarte replaced him and became the team’s daily third baseman for most of April, the following month, he hit his first career grand slam – the grand slam was in the eleventh inning, as part of a 5-for-6, 6 RBI game, leading to the Blue Jays 13–11 win. Who Is Yangervis Solarte’s Wife? Yangervis is currently a widower. The professional baseballer was married to Yuliette Pimentel Solarte, who unfortunately died on September 17, 2016, from complications resulting from cancer. The couple had three daughters together. Jays’ infielder and father of three adorable daughters is well built standing at the height of 1.80m and weighing 88kg. Henderson Alvarez is another Venezuelan baseball player that plays alongside Yangervis in Toronto Blue Jays.